Pine trees offer evergreen color during harsh winter months. Grown nationwide, pine trees are popular landscape specimens and used widely in hedge plantings. They also work well planted along structures. Pine trees require very little care; many never need pruning, and a few varieties grow at a fast rate. However, watch for bugs that often threaten the health of these trees. Pine needle scale (Chionaspis pinifoliae) is a serious pest of pine trees. A tree that suffers a heavy infestation will appear gray, and the needles of the tree will yellow. Severe stunting of the tree's new growth then begins. The insects are easily spread by the wind, mammals and even birds, while the eggs of the insect hatch into tiny red "crawlers." The crawlers feed on the tree's sap through its needles and new growth, then quickly turn yellow. Molting of the crawlers takes place in the summer and the males become winged. The female forms a scale around her body on the pine tree's needles and growth. Within the waxy scale substance, she lays eggs that hatch the following spring into the crawlers, and the cycle starts all over again. Removal of infected trees and insecticide sprays are often utilized to gain control. Pine bark adelgids (Pineus strobi) are pests found across the United States on a wide range of pine trees. The females, eggs and crawlers produce a white cotton-like substance on the needles of the pine tree. Under this unusual substance they live and feed on the tree. The female does not require a male to produce fertile eggs. The insects feed on the tree's sap and are spread by the wind and birds. Trees that are widely infected appear unsightly—but seem to suffer no adverse effects from the insects. A heavy stream of water can easily remove the insects and the cotton substance. Insecticidal sprays that contain imidacloprid can also be used to gain control. Pine aphids (Cinara) feed heavily on many pine tree varieties. The aphids enjoy living in large colonies and sucking the sap from the tree. They produce/secrete a sweet honeydew substance that often causes black mold to grow on the tree. 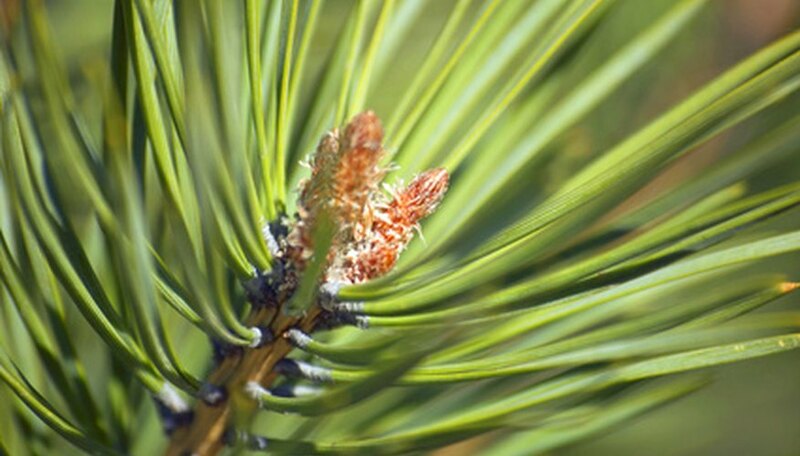 Several varieties of aphids feed on pine trees, but the aphids rarely cause long-term damage. Insecticidal control can be utilized, but most aphid colonies are easily removed by simply spraying the tree with high velocity water to work the aphids loose and wash them away. The mountain pine beetle (Dendroctonus ponderosae) can easily kill pine trees during a heavy breakout, according to Colorado State University. Older trees or trees that are crowded easily become infected. The mountain pine beetle has caused the loss of millions of pine trees throughout the western United States. The beetles tunnel through the tree's bark and create visible holes. Approximately eight to 10 months after the beetles attack the tree, the needles begin to turn yellow. The beetles eat the tree's wood and tunnel deeper in their search for food. Once a tree is infected, there is no method of control to save the tree. It must be cut down and burned. Applications of carbaryl, bifenthrin and permethrin sprays help prevent the beetles from infecting surrounding trees.